February 15, 2012 - Boeing and Jakarta-based Lion Air finalized a firm order for 201 737 MAXs and 29 Next-Generation 737-900ERs (extended range). The agreement, first announced last November in Indonesia, also includes purchase rights for an additional 150 airplanes. "The 737 MAX is the best choice for Lion Air and the best airplane to serve our passengers," said Rusdi Kirana, Lion Air Founder and President Director. "We're excited to be the first airline in Asia to fly the 737 MAX and to be the global launch customer of the 737 MAX 9." With orders for 230 airplanes valued at $22.4 billion at list prices, this deal is the largest commercial airplane order ever in Boeing's history by both dollar value and total number of airplanes. 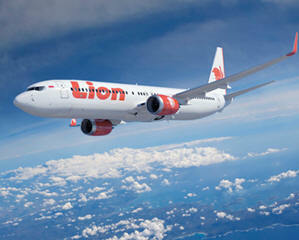 Lion Air will also acquire purchase rights for an additional 150 airplanes. "Lion Air has been a leader in Indonesia from the very beginning," said Dinesh Keskar, vice president of Asia-Pacific and India Sales for Boeing Commercial Airplanes. "Today more people are flying in Asia at lower fares because of the 737 and this historic 737 MAX order will help connect more people in the future." To date, the 737 MAX has orders and commitments for more than 1,000 airplanes from 15 customers and the Next-Generation 737 family has won orders for more than 6,600 airplanes. Lion Air, Indonesia's largest private airline, currently operates or has on order a total of 178 Next-Generation 737s. The Boeing 737 MAX is a new family of aircraft to replace the Boeing 737 Next Generation family. The primary change will be the use of the larger and more efficient CFM International LEAP-1B engines. The airframe is to receive some modifications as well. The 737 MAX is scheduled for first delivery in 2017, 50 years after the 737 first flew. Airlines operating the 737 MAX will see a 10-12 percent fuel burn improvement over today's most fuel efficient single-aisle airplanes and a 7 percent operating cost per seat advantage over tomorrow's competition. Boeing spent most of 2011 evaluating two fan diameters of the CFM International Leap-1B engine: 66.1 in (168 cm) or 68.1 in (173 cm), both of which would require few changes to the landing gear to maintain a 16.9 in (42.9 cm) ground clearance beneath the engines. Boeing Commercial Airplanes CEO, Jim Albaugh, stated the larger fan diameter would produce less fuel burn, but because it is bigger, it produces more drag and is heavier, and would need more extensive airframe changes. Both fan diameters are an increase from the 61.8 in (157 cm) CFM56-7B engine on the Boeing 737 Next Generation. The updated jet is also expected to feature external nacelle chevrons for noise reduction, similar to those on the 787 and 747-8. While the smaller Leap-1B engine would have a lower bypass ratio and higher specific fuel consumption (SFC) than the baseline 78 in (198 cm) Leap-X and 80.7 in (205 cm) Pratt & Whitney PW1100G engine options for the A320neo, the smaller engine will weigh less and create less drag on the airframe. The 66.1 in (168 cm) engine integrated on the airframe would offer an SFC improvement of 10?12% over the current 737NG CFM56-7B engine. Industry sources report that assessments are under way to revise the tail cone, natural laminar flow nacelle and a hybrid laminar flow vertical stabilizer for additional fuel burn and drag reduction. In November 2011, Boeing announced the selection of the 68.1 in (173 cm) fan diameter. Because of the larger fan diameter compared to the 737 Next Generation family, the nose landing gear will have to be lengthened by 6-8 inches (15-20 cm) to maintain the required ground clearance. Firm configuration for the 737 MAX is currently scheduled for 2013. As production standard, the 737 MAX will feature the Boeing Sky Interior with overhead bins and LED lighting based on the Boeing 787's interior, as well as blended winglets. The manufacturer plans no modification in the flight deck as it wants to maintain commonality with the 737 Next Generation family. Boeing also plans to add more fly-by-wire systems to the 737 MAX family, although Albaugh said that changes would be "very minimal." Boeing has confirmed that fly-by-wire will be added to the spoilers.